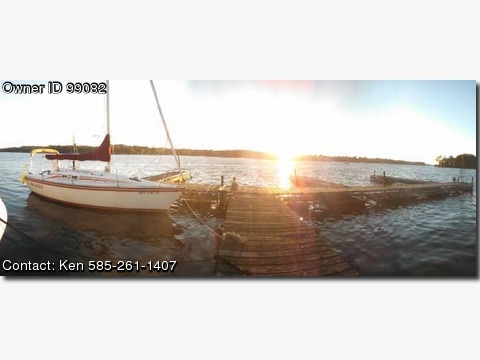 Boat is located in Lyons,New York.Please contact the owner @ 585-261-one four zero seven or kbfireplaces(at)yahoo(dot)com…25.5 Hunter sailboat in good shape, no rot anywhere, outboard 8 hp Honda motor with Teleflex on board controls, 150% Genoa with CDI Roller Furling, both main sail and Genoa in good shape, presurized water, alcohol stove, icebox, galley and head sink, 40amp onshore power hookup,12 volt battery system, Bimini , new sail cover, stereo with speakers, depth finder, bottom coated this spring with ACT Interlux. If you go to marlow-Hunter.com you can get the specs on the boat, Go to our fleet, 25(1984-1987). The boat also comes with a cradle which is on a homemade trailer which could be worked into the deal. The boat is a solid great sailer and very forgiving, a lot of fun for a beginner or an old salt.